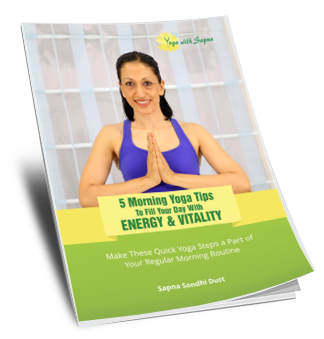 This yoga pose is one of the most basic and well-known among all levels of yoga practitioners. The asana is both an inversion and an arm strengthening exercise. This posture fully stretches the full length of the back of our legs, which is our tight hamstrings and calf muscles. In addition, the full spine is also stretched and the shoulders are worked strongly. Flexing the hips and straightening the knees focuses the stretch on the hamstrings. The gastrocnemius (muscles crossing at the back of the knees) and soleus (muscles crossing the ankles with the gastrocnemius) are stretched when we dorsiflex the feet. When we straighten the arms, pressing the palms actively into the mat, pushing the body back toward the legs, it further deepens the stretch. When we deepen the stretch in this way we can allow ourselves to arch the lower back to give a full extension to the spine. Different yoga teachers execute the ‘Adho Mukha Svanasana’ with a few different variations. The key difference being either overarching the lower back and descending the forehead to the floor, between and below the arms, or instead keeping the head well away from the floor and between the arms, not arching the lower back while maintaining an exact upside down V-position. Let’s address some basic movements involved in working our way into this posture. We need to make note that many of the most intense experiences of yoga take place with small, concentrated, and subtle adjustments. Downward dog involves proper activation of specific sections of the body: the wrists, shoulders, spine, hamstrings, and calves. 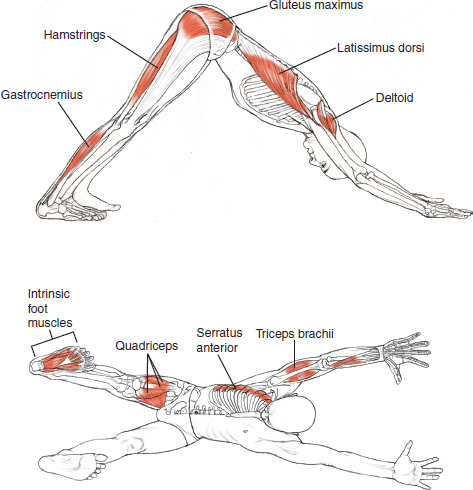 Some of the basic joint positions during the Downward Dog pose are as follows. As we assume this pose, our hips flex, with our “sits-bones”pointing up to the ceiling and our knees and elbows extend and straighten out. As we take the shape of the Inverted-letter- V, we need to feel our palms pressing into the mat, fingers spread out evenly and shoulders flexed and rotated externally. The ankles flex backward, the lumbar spine extends, and the cervical spine flexes. In a Vinyasa Yoga sequence, ( continuous flow of postures ) the ‘Downward facing Dog’ Pose is the resting point. However, it is a daunting experience for new students, during the first few classes, to learn that they should actually be in a restful state while holding this strength building pose. Initially, it is challenging holding this posture. 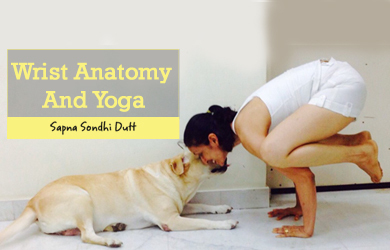 Comprehending the anatomy while in the Downward Dog will help us perform it better. One of the most important and widely misunderstood structures in the human body are the rotator cuffs. This structure is easily prone to injury. The rotator cuffs consist of a group of four shoulder muscles that surrounds our shoulder like a cuff. The main function of the rotator cuffs is to support and position the ball that forms the head of the upper arm bone so that it fits into the socket of the shoulder joint. The joint on our shoulders is unstable. This is why it is important for us to strengthen the supporting muscles, else it can cause the rotator cuff itself to tear. The four rotator cuff muscles are the subscapularis, infraspinatus, teres minor, and supraspinatus. All these muscles originate on the shoulder blade and insert on the upper arm bone, near the humeral head. The subscapularis is under the scapula, between the ribs and the front surface of the scapula. Supraspinatus sits above and infraspinatus sits below the spine of the scapula. If the downward facing dog pose is new to us or if we have tight shoulders, then we may notice that they tend towards internal rotation, with the elbows sticking out to the sides and maybe even bent. In such cases, maintaining some external rotation will keep the teres minor and infraspinatus contracting, and we will probably notice more space opening up in the region of our collar bones. Once we have mastered keeping the external rotators engaged in Downward Dog, we can then apply the action to more challenging poses such as Four-Limbed Staff Pose (Chaturanga Dandasana) and Upward-Facing Dog Pose (Urdhva Mukha Svanasana). Though the downward dog pose stretches the full spine, it is most effective for isolating the thoracic spine between the shoulder blades. The range of motion at the thoracic spine is not much, which is why being able to maintain the posture is important for relieving muscle tension, and dispersing stagnant energy in this thoracic spinal area. In the downward-facing dog, the main focus, as far as spine anatomy is concerned, is to lengthen the spine and open up our upper back. Pushing the shoulder blades down the back, towards the waist is an important and strong move in working the back and preventing the shoulders from hunching. All yoga poses should ideally help us to enhance our posture and assist us in improving our natural movement, which is, the way we actually hold ourselves and move in everyday life. As we proceed to hold the downward dog pose, expanding through the inner body, our outer body lengthens through the sides, also lengthening the oblique muscles of the core and the intercostal muscles between the ribs. In this pose, we can imagine how the space between each rib grows. The action of Uddiyana Bandha or the tucking in of the belly button flattens the lower belly, and in the process engages the muscles called the Transverse Abdominus as well as the lower ribs. Our body simulates the “Upside-down letter V” when doing the downward facing dog pose, and the muscles at the back of our legs and the superficial or surface back muscles get well stretched. These muscles also involve the latissimus dorsi, teres major, and posterior deltoids, as well as the gastrocnemius or soleus complex, long toe flexors, hamstrings, and gluteus maximus. We can gauge the extent to which we can stretch our calf muscles by the flexibility that our ankles have. The more we are able to flex our ankles, the more we can stretch the calf muscles and Achilles tendons. If we have flexible ankles then we can easily keep our heels to the ground while practicing downward dog pose. If we have a restricted range of ankle motion or very tight calf muscles then we will be unable to keep our heels on the floor during the downward dog pose. However, with practice the ankle joint will develop resilience and calf muscles will stretch and lengthen. The downward facing dog is an inversion with the spine in an axial extension. Inversions naturally move the diaphragm cranially, due to which during exhaling the action of the abdominal muscles can become quite deep. While inhaling, the expansion of the ribcage encourages the thoracic structures to be mobilized. All this can be quite challenging in a yoga pose which needs arm support. As we exhale, we need to focus on the movement of our legs — keeping them pressed back and down through our shins and heels. Doing this breathing meditation during the Downward Dog pose can be both very relaxing and powerful simultaneously. Downward Facing Dog requires a lot of work of the chest and shoulders area. This is why the pose can be a great shoulder and chest opener. It is important that we do not sag into the anatomy. We must keep an active engagement in the shoulders, which once aligned, form the base of the pose. Downward Facing Dog can also be an effective source of relaxation for people with mid-back or lower back pain. The muscles that attach from the skull to the pelvis and the erector spinal group, are all actively lengthened. Additionally, with the arms overhead in this position, the latissimus dorsi muscles, attaching from the ribs and fascia of the lower spine into the arms, are all lengthened. As we are able to relax in this posture, we start to feel how nourishing this stretch is. All of the subtle adjustments required in the pose and also our strength and flexibility to maintain the stretch will gradually become easier with time and practice. Downward Facing Dog is a foundational pose that brings us to a place of deep balance. In this foundation pose, we can check our alignment in a very active and functional way. There are very few poses which are more dynamic than a well-aligned Downward Facing Dog that is powered by a steady flow of deep strong breathing. Copyright © 2018 Yoga With Sapna. All Rights Reserved.